Hospitalized patients are at increased risk for candidemia and invasive candidiasis (C/IC). Improved therapeutic regimens with enhanced clinical and pharmacoeconomic outcomes utilizing existing antifungal agents are still needed. An open-label, non-comparative study evaluated an intravenous (IV) to oral step-down strategy. Patients with C/IC were treated with IV anidulafungin and after 5 days of IV therapy had the option to step-down to oral azole therapy (fluconazole or voriconazole) if they met prespecified criteria. The primary endpoint was the global response rate (clinical + microbiological) at end of treatment (EOT) in the modified intent-to-treat (MITT) population (at least one dose of anidulafungin plus positive Candida within 96 hours of study entry). Secondary endpoints included efficacy at other time points and in predefined patient subpopulations. Patients who stepped down early (≤ 7 days’ anidulafungin) were identified as the "early switch" subpopulation. In total, 282 patients were enrolled, of whom 250 were included in the MITT population. The MITT global response rate at EOT was 83.7% (95% confidence interval, 78.7–88.8). Global response rates at all time points were generally similar in the early switch subpopulation compared with the MITT population. Global response rates were also similar across multiple Candida species, including C. albicans, C. glabrata, and C. parapsilosis. The most common treatment-related adverse events were nausea and vomiting (four patients each). A short course of IV anidulafungin, followed by early step-down to oral azole therapy, is an effective and well-tolerated approach for the treatment of C/IC. Candidemia and invasive candidiasis (C/IC) are important causes of morbidity and complications in patient populations including neutropenic patients, solid-organ and stem-cell transplant recipients, patients with indwelling intravascular devices, and patients in intensive care. The incidence of candidemia appears to be considerably higher in the United States (US) compared with Canada and Europe, with the exception of Denmark [1, 2]. The attributable mortality of candidemia in US studies has ranged from 19% to 49% [3, 4]. Over the past decade, the incidence of candidal infections due to non-albicans Candida (NAC) species that are resistant to fluconazole has increased, highlighting the need for optimized antifungal regimens. An initial short course of an intravenous (IV) echinocandin, followed by the option to step-down to oral azole therapy, could be as effective for the treatment of C/IC as conventional 10- to 14-day IV regimens, including for the rarer Candida species. Additionally, this step-down strategy could have added benefits, such as better tolerability, reduced use of IV catheters, earlier patient discharge, and significant cost savings, as documented in oral step-down antibiotic regimens [5–11], although prospective data for de-escalation in antifungal therapy are lacking. In vitro, the echinocandins (including anidulafungin) have reported potent fungicidal activity against most Candida species and demonstrated a favorable safety profile [12–18]. Echinocandins are recommended as the treatment of choice for severely ill and neutropenic patients with proven or suspected invasive candidiasis in recent clinical practice guidelines . An azole, such as fluconazole, is widely used and recommended as a first-line agent for the treatment of C/IC in non-critically ill patients . Voriconazole is also recommended as a step-down therapy for patients with infection due to some of the NAC species following first-line treatment with an echinocandin or amphotericin B. In patients with candidemia, continual therapy until 14 days after the first negative blood culture is recommended. The Infectious Diseases Society of America (IDSA) guidelines include the recommendation to step-down to oral azole therapy as early as possible once the patient is clinically stable and blood cultures have become negative . However, this specific strategy is based on limited clinical evidence for antifungal treatment and has not been prospectively studied. The European Society for Clinical Microbiology and Infectious Diseases (ESCMID) suggests simplification of treatment by stepping down to oral fluconazole after 10 days of treatment if the patient is stable, and tolerates oral therapy, and if the Candida species is susceptible . However neither of these specific strategies have been prospectively studied and the appropriate timing of step-down therapy remains unclear. Recognizing this gap in current knowledge, we evaluated the efficacy and safety of utilizing initial therapy with IV anidulafungin, followed by an optional early step-down to oral fluconazole or voriconazole for the treatment of C/IC in adults. The study was specifically designed to evaluate anidulafungin treatment in a broad group of patients with C/IC caused by various species of Candida and to explore use of an early step-down strategy in a real-world setting. This was a Phase IV, open-label, noncomparative study, involving 44 centers across the US and four centers in the Republic of Korea. The four Korean centers were added to increase enrollment and because treatment practices for invasive candidiasis were similar to those in the US. The trial was conducted in accordance with the ethical principles decreed by the Declaration of Helsinki and in compliance with International Conference on Harmonization Good Clinical Practice Guidelines. The final protocol, any amendments, and the informed consent document were reviewed and approved by the Institutional Review Boards and/or Independent Ethics Committees at each of the investigational centers (Additional file 1: Table S1). All patients or their proxy provided written informed consent prior to study initiation. Patients ≥ 18 years of age were enrolled in the study if the presence of candidemia (positive blood culture) or invasive candidiasis (positive culture from a normally sterile site) was demonstrated from a culture obtained within 96 hours of study entry. In addition, the presence of one or more of the following signs and symptoms of infection was also required: fever or hypothermia; hypotension; localized signs and symptoms of inflammation; or radiological findings of invasive candidiasis. Patients were allowed to participate if they had received no more than 48 hours of systemic azole therapy. Prior prophylaxis with azoles was permitted provided it was discontinued prior to the study. Patients were excluded if they had one of the following: life expectancy of less than 1 month; hypersensitivity to echinocandins or azoles; prior treatment with either an echinocandin or amphotericin B; systemic antifungal therapy had failed for the current episode of C/IC; a diagnosis of fungal endophthalmitis with involvement of the vitreous humor; chronic refractory neutropenia and were not expected to recover (defined as absolute neutrophil count < 500 cells/mm3 for 28 days prior to the baseline visit); or the presence of confirmed or suspected Candida osteomyelitis, endocarditis, or meningitis. Removal of IV catheters suspected to be the cause of infection was required within 24 hours of starting study drug. To allow for delays in scheduling catheter removal in these seriously ill patients, patients who had all catheters removed or replaced to another anatomical location by study Day 3 were considered to have had their catheters removed. All patients received 200 mg IV anidulafungin as a single loading dose and 100 mg IV anidulafungin daily thereafter for a maximum of 28 days. After 5 days’ IV anidulafungin, investigators could transition patients to an oral azole if they met the following criteria: ability to tolerate oral therapy; afebrile for > 24 hours; hemodynamically stable; not neutropenic; and had documented clearance of Candida from the bloodstream. Patients were not randomized or pre-selected to receive early oral step down therapy; rather the decision was made based on the patient’s condition and protocol guidelines. Per protocol, patients with positive baseline cultures for C. albicans and C. parapsilosis were stepped down to oral fluconazole (400 mg/day); all other patients were stepped down to oral voriconazole (200 mg twice daily). Combined IV and oral agents were given for at least 14 days after the last positive blood/tissue culture. Intent-to-treat (ITT) population, all subjects who had taken at least one dose of study drug. All safety analyses were based on the ITT population. Modified intent-to-treat (MITT) population, all ITT subjects with a positive baseline culture for a Candida species. Missing and unknown global responses were not included in the analysis. Patients in the MITT population were further categorized into those who stepped down to oral azole therapy and those who remained on IV therapy. Early switch subpopulation, patients who stepped down to oral azole therapy by Day 7 of the study (Days 1 and 2 of potential switch to oral therapy). Missing and unknown global responses were not included in the analysis. An additional sensitivity analysis was performed, which set missing values and unknown responses as failures. This allowed a more direct comparison between studies, as the global response rates assessed in previous anidulafungin studies set missing and unknown values to failure . Blood cultures were performed at the screening visit and repeated daily until Day 5, and at the end of treatment (EOT) visit. If a positive culture was obtained on Day 5, a repeat culture was required on Day 7. Patients with candidemia whose blood culture remained positive on Day 7 were considered treatment failures and were discontinued from the study. Susceptibility testing was conducted on all baseline isolates using the Clinical Laboratory Standards Institute M27 microbroth dilution method and M27-A3 breakpoints. The primary efficacy endpoint was the global response rate (clinical + microbiological response) at EOT based on the MITT population. A successful global response was defined as both clinical success (cure – resolution of signs and symptoms of Candida infection, or improvement – significant, but incomplete, resolution of signs and symptoms of Candida infection) and microbiological success (eradication – negative follow-up culture for Candida species, or presumed eradication – follow-up culture was not available and clinical response was defined as cure or improvement). Global responses were also assessed independently by a data adjudication committee (DAC), which periodically reviewed certain specified endpoints as defined separately in a charter, but the assessments by the investigator were considered the primary endpoint. In the primary MITT analysis, global response rates at EOT and end of study (EOS) were calculated with missing/unknown outcomes excluded. However, sensitivity analyses were also performed, in which missing/unknown outcomes were set to failure. Key secondary endpoints and other parameters of the study included: global response rate at secondary time points, such as the end of IV (EOIV) treatment, at 2 weeks post-treatment, and at EOS (6 weeks post-therapy); time to negative blood culture; global response rate for the subset of subjects with NAC infections; and all-cause and attributable mortality. Clinical and laboratory evaluations were also performed periodically throughout the study. Routine safety assessments were made during IV and oral treatment as well as during the follow-up period. All adverse events (AEs) and serious adverse events (SAEs) were monitored. Baseline characteristics, global response rates at EOT, and secondary time points for the early switch subpopulation were assessed alongside all MITT patients. The planned sample size was 286 patients, which, assuming an evaluability rate of 70% and a 50:50 distribution of albicans to NAC infections, would result in approximately 100 patients with baseline infections caused by non-albicans species. There were no formal pre-specified statistical decision rules, as this was a single-arm estimation study. No formal hypotheses were tested in this study and the design did not allow for statistical comparisons to be made between the early switch subpopulation and the MITT population. In total, 294 patients were screened for entry into the study (270 in US, 24 in Korea), and 282 patients were enrolled and received treatment. The study was conducted between July 2007 and June 2010. Patient disposition is shown in Figure 1. In the MITT population, 54% were male, with a mean (standard deviation [SD]) age of 55.4 (16.9) years, and mean (SD) Acute Physiology and Chronic Health Evaluation (APACHE)-II score of 14.3 (6.7). C. albicans (45%) was the most common baseline pathogen isolated. For the early switch subpopulation (step-down within 7 days of starting treatment with anidulafungin), demographics and characteristics were generally similar to the MITT population. The APACHE-II score was lower in the early switch subpopulation (mean [SD] 12.7 [6.2]) compared with the MITT population. Patient demographics and baseline characteristics for both the MITT population and the early switch subpopulation are summarized in Table 1. All catheters removed within 3 days of therapy? *Risk factors for invasive candidiasis and catheter management data were systematically collected only after Case Report Form (CRF) revision shortly after study start. Percentages are based on the actual number of patients enrolled in the study after these CRFs were incorporated. Abbreviations used: ANC, absolute neutrophil count; APACHE, Acute Physiology and Chronic Health Evaluation; ICU, intensive care unit; IV, intravenous; MITT, modified intent-to-treat; SD, standard deviation. Of the 250 MITT patients, 100 (40%) remained on anidulafungin treatment throughout the study and had a median duration of 12.0 days of therapy (range, 1–29). One hundred and fifty (60%) of the MITT patients stepped down to oral azole therapy, with a median duration of 6.0 days of parenteral therapy (Table 2). There were 102 patients in the early switch subpopulation; the median duration of IV therapy prior to oral step-down was 5.0 days (range, 1–6) and the median duration of overall antifungal therapy was 14.0 days (range, 5–56). There were 48 patients in the late switch subpopulation; the median duration of IV therapy prior to oral step-down was 10.0 days (range, 6–27) and the median duration of overall antifungal therapy was 19.0 days (range, 8–42). The durations of therapy for the MITT population, and the early switch subpopulation, late switch subpopulation, and no switch subpopulation are shown in Table 2. *Represents the duration of IV therapy prior to oral step-down. Four patients from the early switch subpopulation had to be stepped back to IV therapy after initially stepping down to oral azole as they later became unable to tolerate oral medication. Total duration of IV therapy for these patients is, therefore, longer than reported here. Abbreviations used: IV, intravenous; MITT, modified intent-to-treat. The global response rates at EOT were as follows: 83.7% (95% confidence interval [CI], 78.7–88.8; 170/203 patients) in the MITT; 89.9% (95% CI, 86.0–93.8) as assessed by the DAC; and 68.0% (95% CI, 62.2–73.8; 170/250 patients) for the sensitivity analysis. The global response rates for the primary analysis and sensitivity analyses at EOIV, 2 weeks post-treatment, and EOS are shown in Table 3. *Missing/unknown values set as failures; a95% CI based on normal approximation to the binomial. Abbreviations used: CI, confidence interval; EOIV, end of intravenous treatment; EOS, end of study; EOT, end of treatment; MITT, modified intent-to-treat. In the early switch subpopulation (≤ 7 days’ anidulafungin), the global response rate at EOT was 90.0% (95% CI, 83.8–96.2) and 79.4% (95% CI, 71.6–87.3) for the sensitivity analysis. In general, patients in the early switch subpopulation had global response rates that were higher than the MITT population at all time points (Table 3). The highest successful global response rates at EOT were observed in patients with C. albicans (87.0% [95% CI, 80.1–93.8]) and C. glabrata (86.5% [95% CI, 77.3–95.8]) infections, while the lowest response rates were observed in patients with C. krusei (60.0% [95% CI, 29.6–90.4]) isolated at baseline. Global response rates for the MITT and early switch subpopulations at EOT and secondary time points per baseline pathogen are shown in Table 4. In the early switch subpopulation there were no failures in patients with C. tropicalis or C. krusei infection throughout the study time points, although the numbers were small (9 and 3 patients at EOT for C. tropicalis or C. krusei, respectively). *95% CI based on normal approximation to the binomial. Abbreviations used: CI, confidence interval; EOS, end of study; EOT, end of treatment; MITT, modified intent-to-treat. Median time to negative blood culture for all patients was two days (with Day 1 being the first dose of study drug), and approximately 90% of patients achieved a negative blood culture by Day 5. All but six baseline isolates were susceptible to anidulafungin and only one of the patients with a resistant baseline pathogen was a treatment failure. Three patients receiving oral fluconazole and four patients receiving oral voriconazole had baseline isolates which were resistant to fluconazole and voriconazole, respectively. There were no treatment failures among these seven patients. Baseline isolates from all other patients were documented susceptible to the oral agents used. In total, 33 (11.7%) patients reported a total of 59 treatment-related AEs. Nausea and vomiting were the most frequently reported treatment-related AEs, both reported in four patients (1.4%). Of the 13 patients who permanently discontinued from the study, only one discontinuation was anidulafungin-related (an episode of vomiting). Three patients experienced SAEs related to treatment with anidulafungin as judged by the site principal investigator – acute renal failure, abnormal liver function test, and systemic Candida. One patient receiving voriconazole was identified with a treatment-related SAE case of C. difficile colitis, and one patient was identified with acute renal failure, hypotension, and dehydration as a treatment-related SAE with fluconazole. There were 65 deaths (23.0%) recorded in the 282 subjects receiving at least one dose of anidulafungin. Forty-three of these deaths occurred during the study period (Figure 1). Twenty subjects died after withdrawing from the study for a variety of reasons and two subjects died after completing the study. None of the deaths were considered to be related to study drug or treatment regimens. There were 14 deaths (13.7%) recorded in the 102 subjects in the early switch population. The early step-down from an echinocandin to an oral azole among stable patients with IC is a suggested strategy in the recently published treatment guidelines for C/IC . However, this recommendation is based on limited clinical evidence, expert opinion, and common practice. Indeed, in recent trials of the treatment of candidemia, step-down to an azole was prohibited before 10 days of parenteral therapy with an echinocandin [14, 17, 20]. In this study, a step-down strategy from IV to oral therapy was incorporated as part of the study design. Sixty percent (60%) of patients enrolled in this study underwent early step-down (by Day 7) to either fluconazole or voriconazole. Although baseline characteristics for the early switch subpopulation were generally similar to the overall MITT population, some interesting differences were noted. In the early switch subpopulation compared with the overall MITT population, C. glabrata isolates were less common. Importantly, fewer early switch patients had an APACHE-II score >20 and fewer had a length of intensive care unit stay ≥4 days. This suggests that patients in the early switch subpopulation were less severely ill. In general, the early switch subpopulation showed response rates similar to the MITT population and these response rates were maintained through the end of study. These results demonstrate the efficacy of including an early step-down strategy in treating patients with C/IC. Direct comparison across trials should be regarded cautiously; however, global response rates in both the MITT population and the early step-down subpopulation from this study were comparable to other trials that evaluated anidulafungin for the treatment of C/IC [14–17]. This included the study by Reboli and colleagues, which demonstrated higher response rates for anidulafungin compared to fluconazole for the treatment of C/IC . The most relevant parameter in comparing efficacy results with those in the Reboli et al. study was the global response in the sensitivity analysis (missing/unknown set to failure). In the current study, the global response rates in the sensitivity analysis at EOT for the MITT and early step-down subpopulation were 68% and 79.4%, respectively. This compared with a global response rate at EOIV of 75.6% from the Reboli et al. study. Furthermore, the survival rates and safety profile in the current study were comparable to the Reboli et al. study and other previously reported clinical trials [14–17]. This comparison suggests that a C/IC treatment regimen utilizing anidulafungin in a strategy of early step-down yields similar efficacy and outcome results when compared to previous studies that required a minimum 10 days of parenteral anidulafungin therapy. The early step-down approach used in the current study was effective against a wide range of Candida species. Successful response rates were comparable to the rates seen in C. albicans infections in patients with either C. glabrata or C. parapsilosis infections, the second and third most common pathogens isolated in this patient population. Additionally, failures were not reported for C. tropicalis or C. krusei infections in the early switch subpopulation. Successful global response rates across all time points were similar for voriconazole and fluconazole (data not shown), indicating that either drug could be employed as a step-down therapy after IV anidulafungin. One hundred patients with candidemia remained on IV anidulafungin throughout the study. These patients tended to be more severely ill at baseline, as reflected in a higher APACHE-II score, or were more likely to have had recent abdominal surgery and the concern about adequacy of oral absorption. The high global response rate (88.5%) at EOIV is likely to be reflective of the high level of activity of initial treatment with anidulafungin; this is further supported by the rapid eradication of Candida from blood cultures. In contrast to prior candidemia studies, daily blood cultures were required (Days 1–5), allowing for a rigorous assessment of culture eradication times. The median time to blood culture eradication in this study was two days, consistent with the in vitro fungicidal activity of anidulafungin and other echinocandins against most Candida species . Based on the findings of this study, patients with C/IC are suitable candidates for step-down oral antifungal therapy provided the Candida has been cleared from the bloodstream, the patient is clinically stable and capable of taking oral therapy. The advantages of the approach, beyond its convenience and flexibility, include possible additional clinical benefits, such as shorter duration or need for intravascular catheters, decreased length of stay and a potential cost saving, as documented for other, antibiotic, step-down regimens [5–11]. Limitations of the study include the fact that the study was not appropriately designed for statistical comparison between the early switch subpopulation and the MITT. Likewise, there was no controlling for baseline severity factors between these two populations. Additionally, this was an open-label study, therefore there was no active or placebo comparator for the response rates observed. 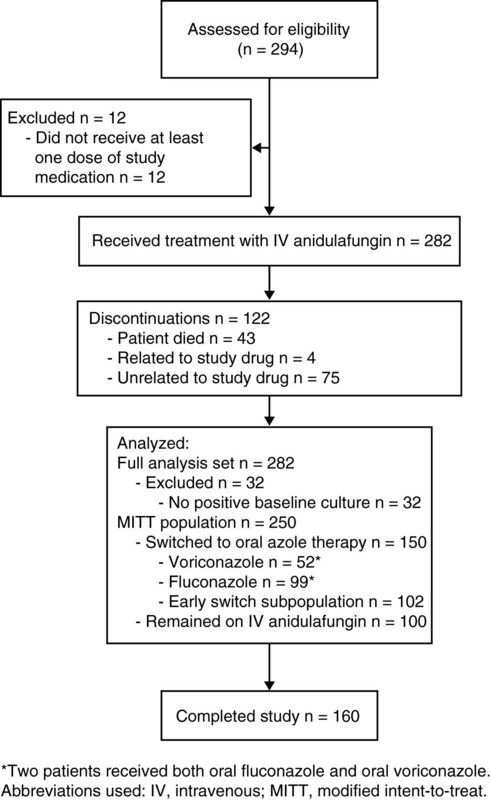 A strategy utilizing initial therapy with anidulafungin for 5 days followed by an optional step-down to oral fluconazole or voriconazole, based on isolated Candida species, is an effective and well-tolerated regimen and could be employed as an alternative treatment regimen for patients with C/IC. Shorter transition times may be possible dependent upon earlier laboratory results and patient response rates to initial anidulafungin parenteral therapy. An IV to oral step-down strategy may have a favorable impact on removal of intravascular devices, hospital length of stay, and cost. The authors would like to thank the A8851011 investigators and study team. Editorial support was provided by Anne Marie Reid, PhD, and Philip Matthews, PhD, at Complete Medical Communications and was funded by Pfizer Inc. This study was sponsored by Pfizer Inc.
PB and RS are employees of Pfizer Inc. DHK is a consultant for Pfizer, and has received honoraria or speaking fees from Pfizer Inc, Astellas, and GlaxoSmithKline, and grants from Pfizer Inc and Akers Bioscience. PGP has acted as an advisor for and has received research grant support from Pfizer Inc, Merck, Astellas, Gilead, and T2 Biosystems. ACR has received research grant support and acted as a lecturer and consultant for Pfizer Inc. JV has received research grant support from Pfizer Inc, Merck, and Astellas. TP has served as a consultant for Pfizer Inc, Merck, Astellas, Toyoma and Viamet, and has received research grants from Pfizer Inc, Merck and Astellas. PB and RS conceived and designed the study. PB carried out the statistical analysis. PM, PRH, JV, AR, PP, TP, JR, PC-H, ET, DK performed the study. All authors reviewed and approved the final manuscript.